For all the complexity of the human mind, when it comes down to remembering what we’ve been up to for the last few weeks our memories are pretty pitiful – you might remember a few notable events, but your day-to-day activities barely make a dent. And while some of us are not prone to such bouts of mental inadequacy, the vast majority of the population probably can’t remember what they were up to last weekend, much less a month ago. 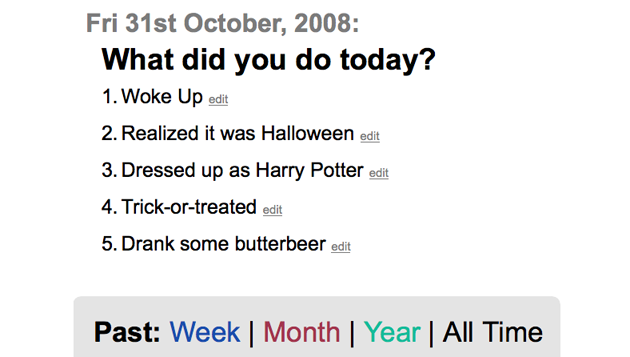 Memiary, a site built by developer Sid Yadav over the course of a weekend, is looking to help you remember what you’ve been doing with your life. The site is a micro-diary, offering a private place to fill in your thoughts and takes only a minute or so to fill out every day. Blogging fills this role well enough for many people, but most of us aren’t comfortable with sharing the most personal details of our day-to-day lives with anyone who stumbles across our webpage. And most of us simply don’t have time to fill out longform diary entries, so the short text snippets work well. Getting started is simple: enter an email address and password, and you’re presented with five text fields asking what you’ve done today. Fill those in, click the checkbox next to each one, and you’re done. Each of those daily activities is saved in a log, which can be browsed through later. At this point the site is very barebones (understandable because of its short development time), but I’d like to see more ways to input my daily activities, such as through a SMS message. It’s a fun little site and will probably be pretty handy for users that consistently keep it updated. It could even drive a few people to rethink their lives – I can’t help but envision users suffering mid- or quarter-life crises as they realize their days almost invariably consist of the same five activities. You can check out Yadav’s blog post on creating the site here.